Reading progress update: I've listened 137 out of 887 minutes. 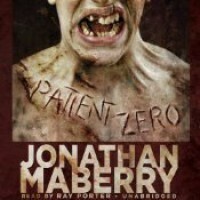 This is a zombie book starring a ridiculously competent cop-turned-FBI agent (or something - it's complicated). So far it's surprisingly boring, and I've eyerolled so hard during some of the terrorist portions. There's this mad scientist lady who is apparently so alluring that merely glancing into her eyes causes men to lose their common sense. But we're told that it isn't sexual, it's just the power of her personality. But also it is sexual, because she's been screwing at least two men's brains out, her husband and the guy her husband is working with. ::sigh:: I'm not looking forward to the moment she and the main character meet. I'm sure he'll simultaneously loathe her and find her attractive.